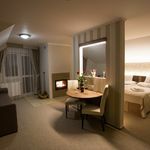 Situated on National Road DN 13 A, only 10 minutes from the center of the main city Odorheiu Secuiesc, the boarding house “Boroka” is the ideal choice for business people arrived for seminars, courses, conferences, teambuilding programs or negotiations, but at the same time also for families who wish to celebrate festive unforgettable events in a warm, family like environment and in exceptional comfort conditions. The presence of the cozy atmosphere, warm and family like is felt since the entrance at the boarding house, where a huge living is opening in front of your eyes, and there is also the diner room that can be transformed, at request, in a festive setting to organize ceremonies for 40 persons (wedding, baptize, anniversary), courses or meetings of “teambuilding” type. Still on the ground floor, as a continuance of this room, there is a spacious kitchen, modernly equipped where those who wish may exercise their skills in the culinary arts. Once arrived on the first floor, the guest has the surprise of identifying another multi-functional generous space: a special corner conceived for business people, equipped with a desk and printer, computer connected to the Internet network and fax; in the middle a pool table draws the attention, perfect for those who want to relax actively after a tiring day of work; leather couches guarantee comfort for those who intend to watch the TV programs on a plasma screen of a considerable size, set up like a picture in the multi-functional hall. 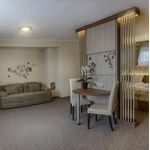 At the same level there are boarding rooms arranged, the total capacity being 17 places, in 4 rooms with two beds and 3 rooms with 3 beds, furnished in a simple but elegant setting, each painted in a different color, equipped with TV and free access to Internet. 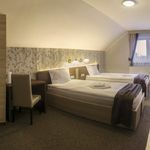 Each room has bathroom, with ultramodern equipment, following the vivid and joyful color lines of the rooms they belong to. Another bathroom, of a bigger size, equipped with jacuzzi, represents the ideal choice for you to relax and relieve stress through the wonderful effects of the hydro-massage. The interior garden has a terrace, an oasis of green and peace far away from the turmoil of the city, and we arrive here by passing through the ground floor room, this garden comes to complete the facilities and comfort we want for the guest who passes the threshold of the “Boroka” Boarding house. It is ideal to serve dinner or lunch, but also to prepare a grill in open air, or even homemade bread in the rustic oven set for this purpose. The summer garden assures at the same time a generous and safe space for children to play in. 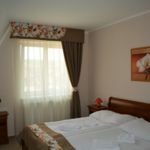 We are convinced that after a holiday spent at the “Boroka” Boarding house, you will return. We shall be waiting for you dearly! Reserve your accommodation and Boroka Panzió Székelyudvarhely will directly send the confirmation in 1 workday. The rating of Boroka Panzió Székelyudvarhely is 9.9 from the maximum 10, 14 based on actual and valid guest ratings and reviews. "Áramfejlesztő nagyon hangos volt. Nem jelezték, hogy milyen időközönként kapcsol." "Barátságos, családias, vendégszeretők, maximális figyelem a vendég iránt, Amit hirdetnek, azt a szolgáltatást nyújtják." Based on the reviews and comments of actual guests, the services of the Boroka Panzió Székelyudvarhely have received a high rating of 9.9/10.